Cavium has achieved considerable success with several big-name partners showing off servers based upon its 64-bit ThunderX ARMv8 processors at the ongoing SC15 conference. Companies including E4, Gigabyte, Inventec, Penguin and Wistron have announced new server portfolios and shipments at SC15 this week. These partners are demonstrating optimised systems that can be variously used for High Performance Computing, Compute Intensive Data Analytics, Scale Out Storage and Hyperscale Data Centres. 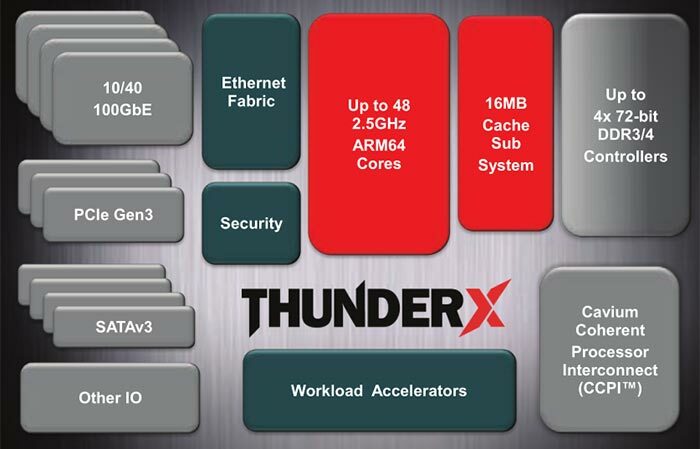 The processor upon which the partner servers are all based is the 64-bit ThunderX ARMv8. This family of processors offer "high performance custom cores, single and dual socket configurations, very high memory bandwidth, large memory capacity, integrated hardware accelerators, fully virtualized core and IO, scalable Ethernet fabric and feature rich I/Os that enable best in class performance/$ and performance/watt," according to Cavium's official product family page. There are multiple Workload Optimized SKUs available optimised for different computing tasks including computation, storage, networking and security (see diagram below). Cavium ThunderX ARMv8 28nm SoCs can possess up to 48 cores running up to a 2.5GHz clock speed. At SC15 Gigabyte announced a complete portfolio of ThunderX ARMv8-based servers ranging from single-socket R120 systems, to dual-socket R150, R270 and high-density H270 systems. Shipments have already begun to end customers and OEMs. Italian manufacturer E4 Computer Engineering announced production availability and customer shipment of ARKA server platforms with Cavium ThunderX ARMv8 Workload Optimized processors. Both single and double socket ARKA systems from E4 include support Nvidia Tesla GPUs. Inventec facilitates Hadoop, cloud computing and Hyperscale workloads with its new K850G3 Server Platforms with Cavium ThunderX Workload Optimized processors. This enterprise and cloud, datacentre and storage firm will offer a complete portfolio of ThunderX ARMv8-based servers ranging from single-socket R120 systems, to dual-socket R150, R270 and high-density H270 systems. 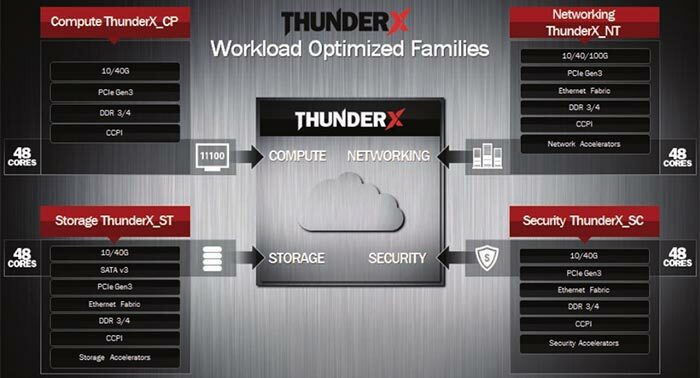 Penguin Computing announced the first customer shipments of its Tundra Extreme Scale (ES) server based on Cavium's 48-core ARMv8 based ThunderX Workload Optimized processors. These servers are in a standard 19-inch rackmount and will become generally available early next year. Wistron announced a range of new servers optimised for datacentre, cloud and cloud storage markets. Wistron's first hunderX-based server is the WV-H7202-10 Hyper- converged system, a 2U platform with two dual-socket server nodes, and support for up to 1TB of DDR4 2400Mhz memory per node, and 8 NVMe PCIe Gen3 x 4 or SATA 2.5-inch SSDs per chassis. 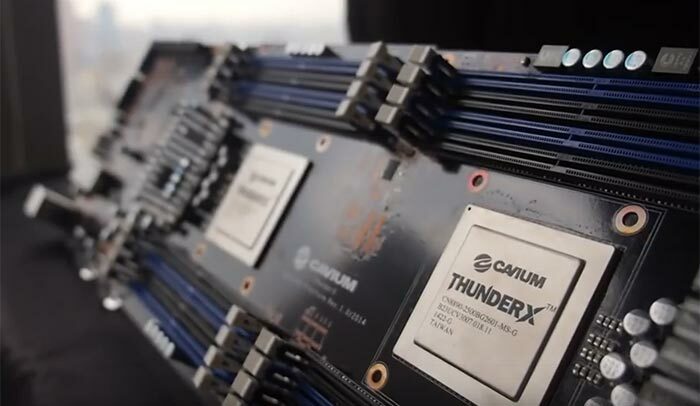 Supporting its hardware endeavours with robust and efficient software, Cavium will be working with Bright Computing to support the ThunderX processor family. The partnership aims to deliver the comprehensive software solutions of Bright Cluster Manager to ThunderX for provisioning and managing HPC clusters, Hadoop clusters and OpenStack clouds in the data centre or in the cloud. Above there is a great deal of positive news flow for Cavium and a telling sign of the positive reaction to the efficient ARMv8 architecture and its flexibility. A cherry on the cake for Cavium is that its flagship 48 core ARMv8-A based ThunderX Workload Optimized processor won the Readers' and Editors' Choice Award for Technologies to Watch at the current SC15 in Austin, Texas. "This award is yet another indicator of the tremendous momentum and recognition that Cavium has created in the server market with ThunderX. We continue to expand our system and software partners to accelerate end user delivery and deployment in some of the leading HPC customer environments worldwide," said Gopal Hegde, VP and GM, Data Centre Processor Group at Cavium. two dual-socket server nodes, and support for up to 1TB of DDR4 2400Mhz memory per node, and 8 NVMe PCIe Gen3 x 4 . Then again there is the new intel Xeon, Knights Landing which supposedly will sport 72-cores and a upcoming Broadwell-E i7-6950X with 10 physical CPU cores and support for 20 threads. Come along a bit since the time when we had pentium 4's with 1 core and hyperthreading (I think there was also a pentium D with 2 cores). All this sounds good, but I keep hearing that there is still a lot of hassle setting up games and a lot of other programs to use these desktop versions to their potential (fully utilising all the cores and threads). But from what I understand, it is good for servers.